Bradman Lake :: From oven to palletizer! Bradman Lake has acquired Ibonhart, a specialized and innovative manufacturer of bread and baked goods bagging, slicing and packaging machinery to complement Bradman Lake’s product offering to the bakery sector. See us at booth # C-4027 at PackExpo to learn more how we can offer you a complete, fully-automatic, baked goods packaging system from the oven to palletizer. Visitors to the booth will be able to see in operation, for the first time in the USA, the very latest integrated packaging technology in a state-of-the-art packaging line comprising of Flow Wrapping and End Load Cartoning. Watch sneak-peek video. To demonstrate the unique capability and expertise in developing and manufacturing both end load and top load packaging equipment, Bradman Lake will also display a well-established top load cartoning line. All of the machines – delivered and supported by award-winning customer service – have been specifically designed to meet the challenges of today’s packaging industry by improving efficiency and flexibility in order to increase profitability. The innovative end load packaging line comprises of a FT120 Flow Wrapper and the IMSL End Load Cartoner. After the products have been flow wrapped, they enter the IMSL End Load Cartoner – Bradman Lake’s latest machine. The compact-footprint IMSL incorporates a Rockwell Automation iTRAK unit to create a fully integrated product infeed system that uses minimal product transfers. To further enhance the IMSL’s footprint the products are side loaded into the cartons via a Linear Motion Loader. The system is set-up with a single point of access with remote connectivity for online fault diagnostics and ‘Factory Talk Analytics’ for system data collection. The system incorporates the latest integrated connectivity Industry 4.0 technology to communicate seamlessly over a common network and protocol. This enables the installation of customized systems that deliver enhanced productivity, rock solid security and operational intelligence with live data output to drive smarter management decisions. This flexible, intelligent system allows for an exhaustive range of possible system configurations to meet every conceivable packaging need. Factory Talk View Point is utilized for local connectivity to link each machine, providing system control and performance data locally at each of the machines HMI’s. Factory Talk Analytics is utilized for remote connectivity to transmit data remotely to a secure machine cloud to provide real time machine and system data that can be viewed remotely from around the globe. The well-stablished top load line comprises of the HSS Double Head Lock/Glue Servo Former and the IL120 Three Flap Carton Closer. "Our technologies are influenced by our ability to serve a variety of markets with tailor made solutions, and at the same time developing new and innovative packaging technologies to suit current day market demands. Our investment to achieve this, demonstrates our commitment to our customers". Operates at the highest level of efficiency and seal integrity even for difficult heat-seal applications. Reduced number of operators. Can be integrated with complete range of product-specific handling systems for semi and full automation. High standard of machine specification, which can include twin film reel holders, automatic film reel-to-reel splice, splice detection and rejection, print registration, automatic film web alignment, film printing, empty and deformed pack identification and rejection, four pairs of longitudinal seal crimp rollers provide hot- or cold-seal options and a robust end-crimp sealing module. Incorporates iTRAK technology, which has been utilised for flexible product collating, while reducing the number of transfers by means of guided pockets to ensure minimal product handling and repeatable carton loading. A new servo-driven linear inserter tracks the guided pockets and transfers each product into the carton, negating the need for a traditional ‘barrel loader’. This delivers excellent access for the end user, the option of constant or indexing motion on the same machine and greater flexibility in handling a wide range of products and collations with minimal rapid size changes. With a small footprint, new frame style and full-height doors for ease of access, the machine has fully integrated electrical panels and Nordson Liberty hot melt system, with direct interface to the Rockwell Automation programmable controller using pre-loaded customized add-on instructions. No black boxes! The machine is designed with an easy loading low-level carton hopper. Incorporates advanced techniques that allow changeovers to take less than 5 minutes and require only a single operator. Machine can glue or lock cartons. Tool-less size changeovers. This significantly reduces downtime and increases productivity for customers that run several different carton sizes. Uses unique ‘Flexible Carton Control’ (FCC) technology that allows for cartons containing product of inconsistent size, protruding above the carton base, to be closed without jamming. 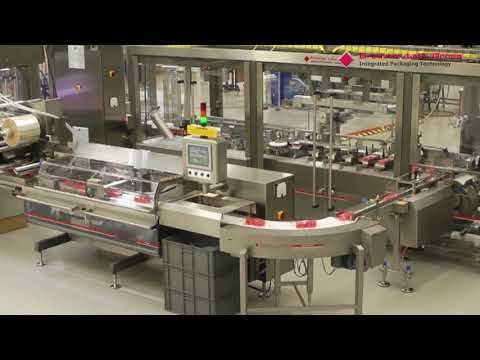 All machines deploy the latest Allen-Bradley hardware and software from Rockwell Automation. No black box. All machines are designed with minimum frame sizes and easy-access guard design. Flexible ‘Future Proof’ Principle. Handles a wide range of products or cartons, formats and sizes to easily meet the demands of the fast-changing markets at any time in the future. Systems are simple to operate and maintain. Robust and well-built to the latest safety and hygiene standards required in the bakery, confectionery, dry, chilled and frozen food and healthcare industries. Upgradable machine construction to handle wash-down applications. Prompt, reliable technical support, service technicians and spare parts delivery. Bradman Lake is an established brand with a strong reputation for machine reliability and value for money worldwide. A wide range of optional features are available to enable the equipment to be readily adapted to meet the customer’s specific requirements. Visitors to the stand can find out more about the advanced features of these machines as well as the group’s other integrated packaging technologies, which can be supplied turnkey or individually.